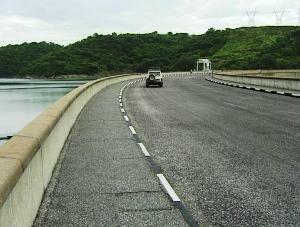 When build Lake Kariba was the largest man-made lake in the world. The lake formed, by the dam wall -- 281 km long, 32 km across at its widest point, and covering 5000 square km -- is now one of Zimbabwe's major tourist attractions. Tourism, however, was far from the minds of those who, in 1950 pointed out that the growing demands for coal by existing thermal power stations in central Africa could not be met after 1960 by the railway system. A source of hydro-electric power would have to be found. The largest river in central Africa, the Zambezi, seemed the obvious source of water and the Kariba Gorge met all the criteria for a dam wall. 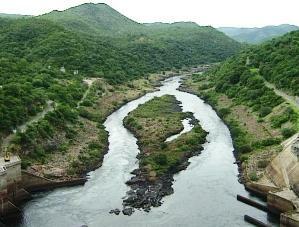 The Gorge had been discovered by David Livingstone and its position as a bottleneck at end of the wide Zambezi Valley that lies downstream of Batoka Gorge was ideal. In 1954 work started on the dam wall. During the construction period over 70 people gave their lives for the project as floods washed away bridges. In early 1958 the river rose 35 meters above its winter level. 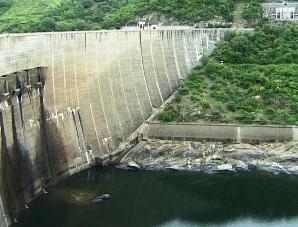 In December 1958 the dam was completed and the lake started to fill up over a period of 5 years. During this time, small islands were formed by the rising water, trapping more than 6000 wild animals of all sizes. The Game Department set out to rescue these animals and Operation Noah was set in motion. This proved a mammoth task and by the end of 1959 over 6000 animals, elephant, buck, rhino, lion, leopard, zebra, snakes and numerous smaller animals and birds had been rescued. The local Batonka tribe, who also had to be re-settled, believes their river god, Nyaminyami, half-serpent, half-fish, would one day revenge the damming of the mighty Zambezi. Before entering Mozambique we decided to camp on the Zimbabwe side of the border as we were planning for an early start the next morning. Our next overnight stop would be the scenic seaside resort of Inhassoro and that is a full day's drive from the border at Espungabera where we planned to enter Mozambique. 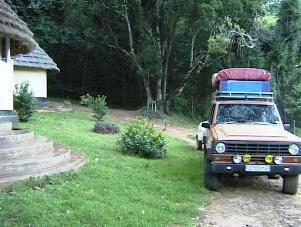 Another reason for our stopover this side of the border is that it would give us the opportunity to camp in the unique Chirinda Forest. Chirinda is managed by the Forestry Commission and covers 950 hectares of which 660 hectares is moist forest, the most southerly true rainforest in Africa. 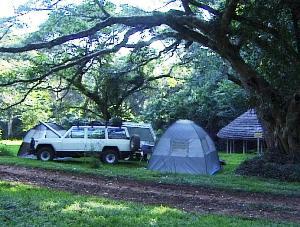 Sustained by the moist airflow from the Mozambican coast, Chirinda offers a beautiful campsite with excellent facilities, which include chalets, hiking trails and other sights, including the big tree. Camping fees are very generous. Drinking water is supplied by the Management and a visit to this beautiful forest is highly recommended. 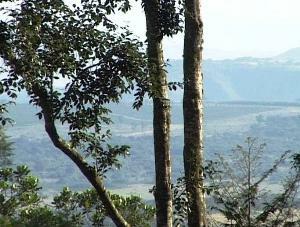 Even if you fail to catch a glimpse of Sweinerton’s Robin, Hewitt’s Long Toed Frog, the Neokoton’s Acrea Mimic Butterfly or to hear Samango Monkeys bickering in the canopy, you will at least experience the timeless quality of a forest which has remained relatively unchanged for thousands of years. 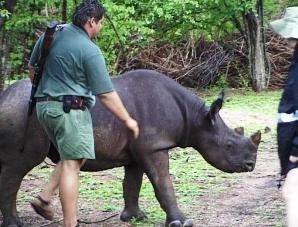 Matusadona once had the largest black rhino population in Zimbabwe. Today many of their shuttered skulls are lined up like white tombstones along the road in the Chete safari area. Dismal reminders of poachers, who shot their way through the area, in the 70s and 80s.What a sad end for these creatures which, with huge effort, were saved from the rising waters in Operation Noah. 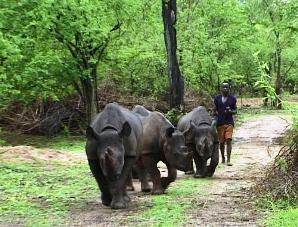 Matusadona is now an Intensive Protection Zone as the small number of remaining rhino are successfully protected day and night by parks board personnel. 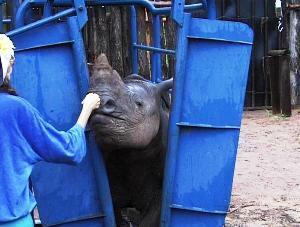 Newly introduced young rhino are kept overnight in bomas under the watchful eyes of armed guards. Still being babies they need to be fed twice a day with a nutritious milk formula, mamma style. Then they are off to explore their new and save territory accompanied by a armed scout complete with 2 way radio who will protect them with his life.